After getting quite stuck on our foyer makeover in recent weeks, I decided to take my own design advice and create a design plan for the space. 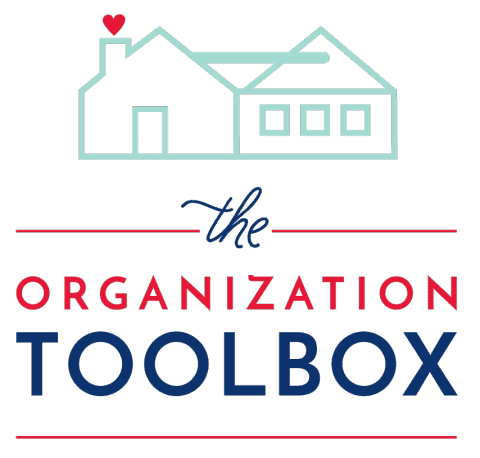 After a lot of brainstorming and playing around with various options, I finally landed on a plan I love (check it out here if you missed it last week!) On the design plan, I show a series of 7 prints I am planning on using to create a gallery wall on our massive entryway wall. While the design plan might make it look like I easily settled on this collection of prints, the truth is it took me hours (and hours) of playing around with various options until I settled on just the right balance and assortment of artwork to not only fit our wall but also look collected and intentional. This exercise reminded me that creating a gallery wall isn’t always the easiest of home decor tasks, so I thought I’d share my tried-and-true tricks for creating great gallery walls that work as well as a bunch of collections I love but just don’t have room for in my home! Let’s jump in! As someone who loves and appreciates design, I know and understand that artwork is an important element in every room. In fact, some of my favorite rooms that I’ve pinned or pulled out of magazines over the years have a central piece of art that brings the whole room together. But as a renter, artwork can also be a big ol’ struggle. 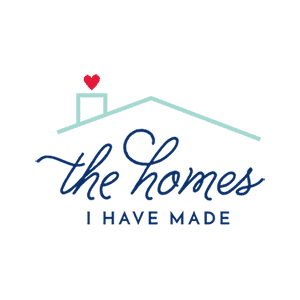 Sure…it is one of the best ways to put your personal stamp on a home, add color when you can’t paint, and fill up large empty walls. But it’s also very space specific…so what works in one home just right, might not work in another at all. As a family who moves a lot (and a gal who tends to re-design rooms with each move), I’ve been reluctant to invest in super high-quality pieces because there is just no guarantee it will work in home after home (and survive move after move!). For our season of life, “investment art” just isn’t practical or feasible. I certainly realize the value in collecting pieces you love over time. But when you move into a home (for a short period of time) and have a huge wall to fill on a budget, it can be hard to leave that wall blank while you wait for the perfect pieces (or funds!) to come along. 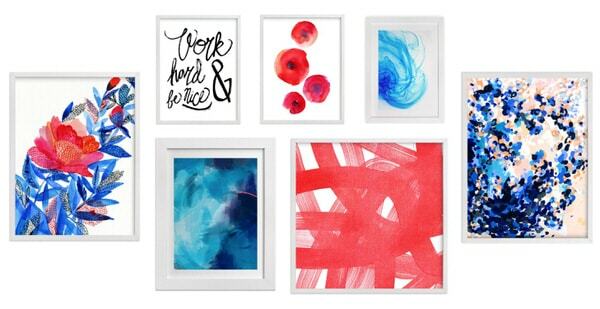 Over the years and with each home we move into, I’ve found myself gravitating toward Minted more and more as my one-stop-shop for bringing quality yet affordable art into our home. 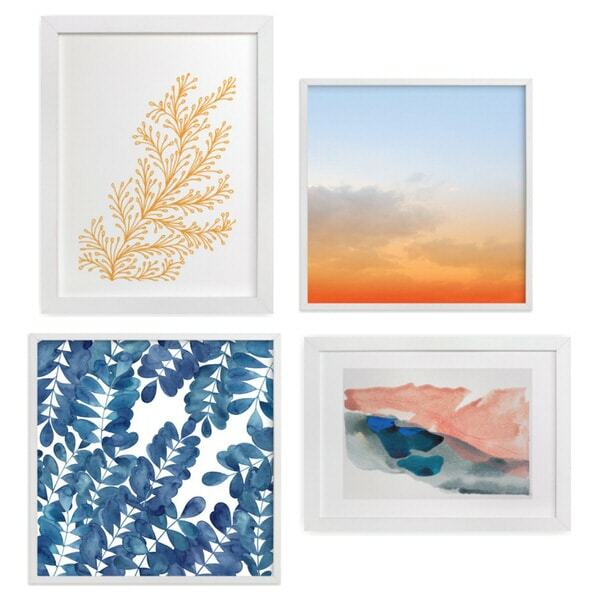 Minted is an online marketplace filled with thousands of wonderful and unique art options at really great prices. Not only is the art very high quality and created by real artisans, but you can shop by color and order prints in any number of of sizes. The flexibility, customization, options and price point make Minted the perfect option for finding exactly what you need for whatever space you’re in. 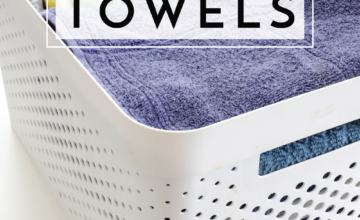 If you read no other tips in this post, read this one: my best and most valuable tip for selecting pieces that work together is to connect them to each other in some fashion. This connection can be color, subject, style, texture, frame style, or other element, and doesn’t necessarily need to be the same element across all your selections. So…for example…Piece A could have matching color as Piece B…and Piece B could have the same frame as Piece C, all while Piece D has different frames and different colors but has the same subject matter as Piece A. All of your selections need to “talk to each other” in some way in order to feel cohesive and intentional. There are some instances when having frames all the same size and shape works really nicely; yet others when having varied dimensions creates a more interesting display. 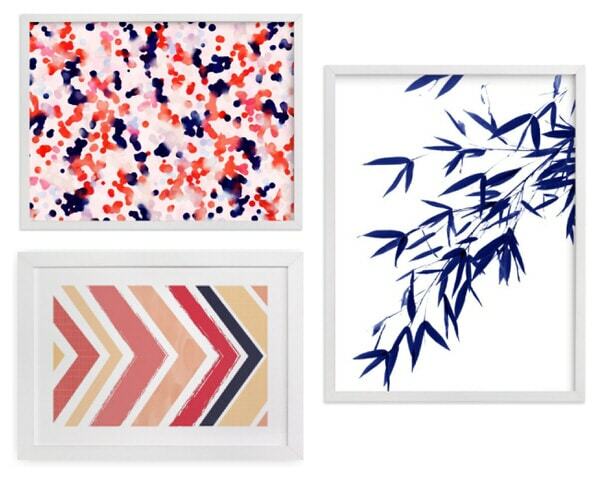 I recommend using my Design Board method to play with different-shaped and -sized frames until you find an arrangement that works with the art you want to include AND where you want to hang the arrangement in your home. Some art, based on the subject matter or composition, needs to be hung in a certain direction. However, (many) abstracts and some still-life pieces can be hung in any orientation you prefer. If you find a piece that has the colors you want but not the shape (landscape versus portrait, or vice versa), experiment with rotating it to see if you can get it to play just right with your other selections. You’ll notice that most of the example collections in this post include pieces with a lot of overall color AND others that have more white space. Not only does this contrast provide some interest and variation to your overall collection, but the added white space gives your eye a place to rest amid a wall of colorful art. Adding in just one piece with a lot of white space can bring much-needed balance to a collection that is feeling a bit busy or off. Just like adding in some white space helps break up a collection of similar pieces, so does typography. 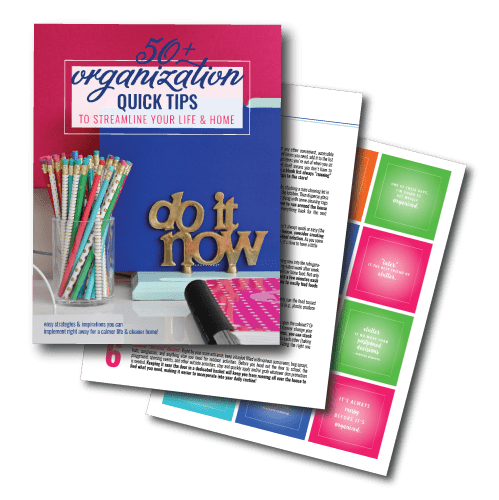 Adding in meaningful letters, numbers, or phrases can add a little more interest, make your collection personal to you or your family, and can provide a contrasting style to some other artwork you may have included. 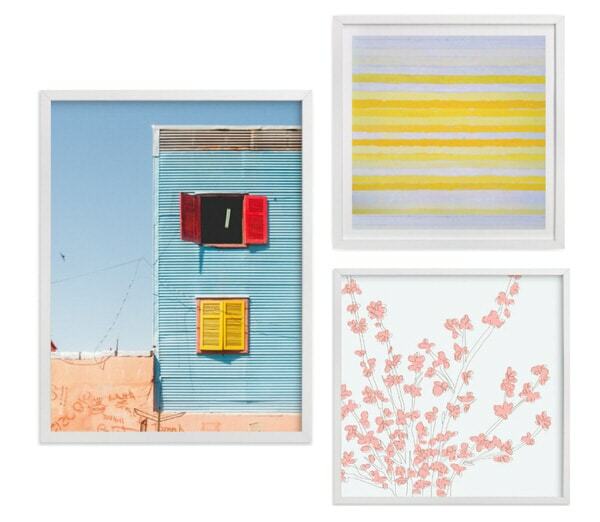 Your gallery wall doesn’t need to include only abstracts or only photographs or only still lifes. In fact, I’d recommend that it doesn’t! You can mix any number of subject matters you want…BUT…as I said in the beginning, just make sure the different subject matters connect to the other pieces in some other way (color, style, size, frame, etc). 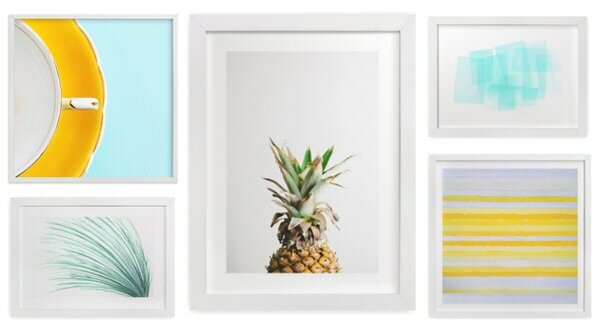 In the collection above, the pineapple and pine needles connect both in color (green) and subject (nature). The coffee cup isn’t nature or green, but it’s a photograph rather than an abstract (turquoise, stripes), so it still connects with the others, ultimately making a cohesive yet interesting set. 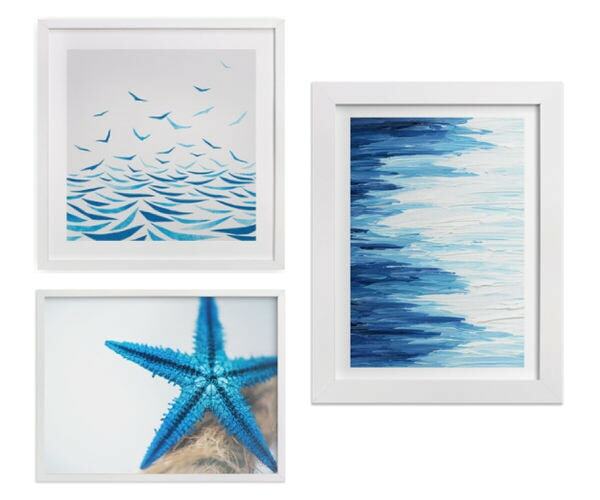 Although all the examples I have shown in this post are gallery walls created with art prints in frames, don’t hesitate to add in other mediums to give more balance and interest to your selections. 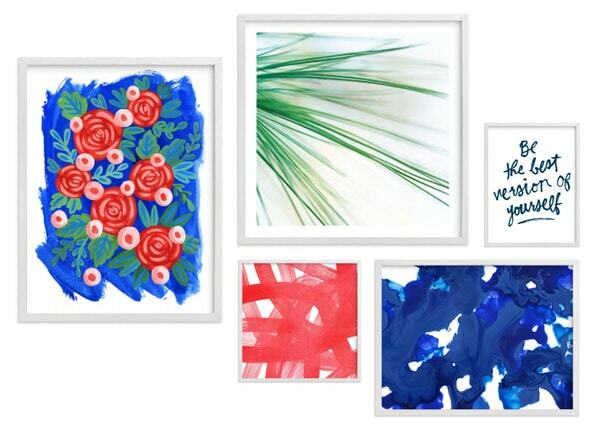 Canvases, paintings, drawings, plants, and even dimensional art (like all the wall art items you see at places like HomeGoods, Hobby Lobby, Target, etc) are all good choices. Again, just make sure whatever you add has a “partner” in color, style, texture, subject, etc. The art isn’t the only thing to be considered in a gallery wall. 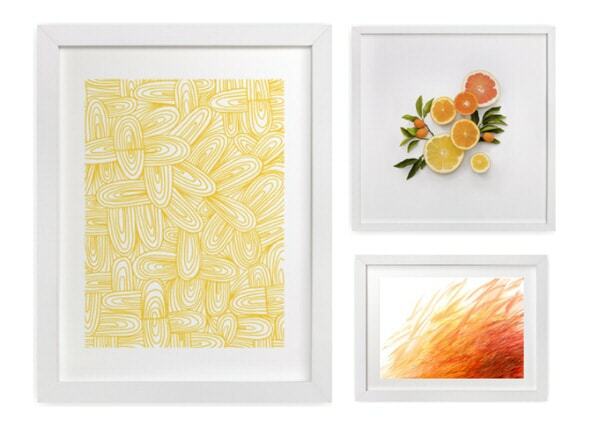 The frames are another element that can add interest, variety and/or consistency when needed. I prefer to keep all my frames white and change up the art inside (that’s more of a logistical convenience because we move so much: all white frames makes swapping things from house to house and room to room easier), but you can always change up frame colors, textures and styles to complement the artwork, bring in other colors, or help match items that don’t otherwise go together. Finally, when selecting pieces, don’t overlook the power of “gut reaction.” Choosing art is a personal and emotional thing. If you can’t stop looking or thinking about a particular piece, even if it doesn’t match your home, consider building a gallery collection or room around it. Just like a gallery wall itself, an art piece just needs some connection around a room for it to make sense. If you can’t build a gallery wall around a piece you love, consider adding a pillow, blanket, rug, or other accessory to help it make sense in your home. As I mentioned in the beginning, I got a little carried away creating some gallery wall options because I just kept finding prints and colors I wanted to play with (#designnerd)! 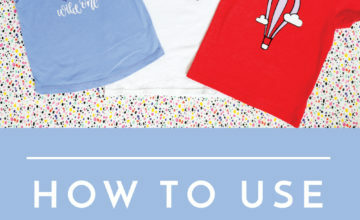 Before I sign off, I thought I’d share some (quick) tips for how I found all these various prints to go together! 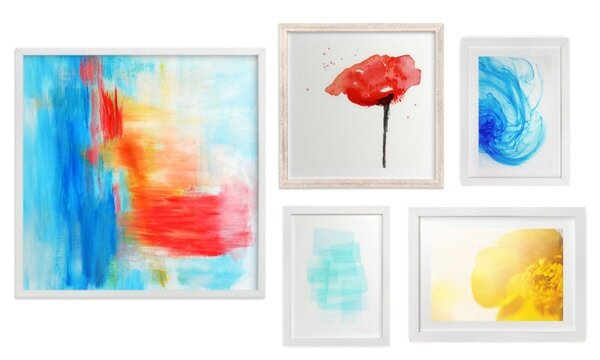 I started by simply surfing Minted’s extensive collection of art and looking for pieces I LOVED…prints or photographs that I had that “gut reaction” to. Quick examples are that multi-color abstract (above, left) and the multi-colored house (below, left). These “gut reaction” pieces became the foundation for the whole collection. 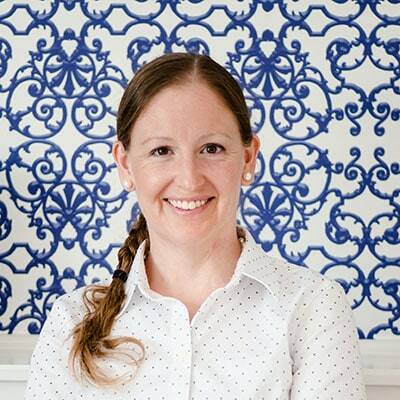 Once I had my main, “gut reaction” piece, I then used Minted’s filter functions to look for coordinating pieces that had those “connecting” elements. The easiest way to do this it to pull a color out of the foundation piece and search by color. Continue to search by color and subject matter to find several (more than you think you’ll need) options that might work with your foundation piece. Once I had a bunch of contenders, I used my design board method to play with different sizes, shapes, and orientations until I had a collection of pieces that felt balanced and interesting, varied yet cohesive. If something is still feeling random or off, continue to search for other coordinating pieces that can bring in a new element that might be missing. 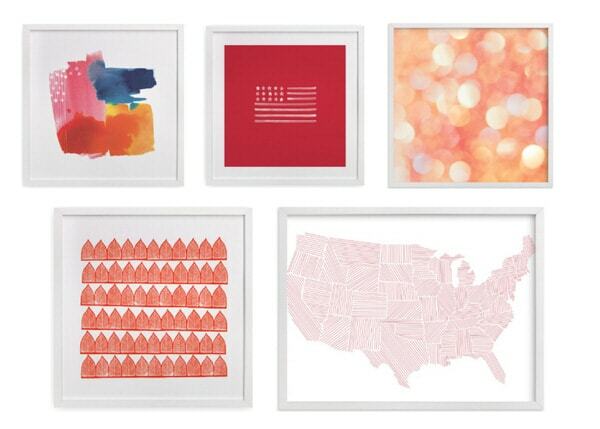 One of the best aspects of Minted is that you can order pretty much any piece in any size you want. This is so helpful because you can truly customize your selections to fit not only your preferred arrangement but also to fit your exact wall. 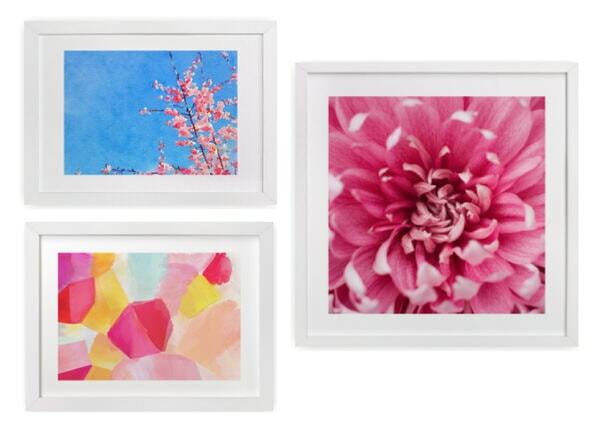 Before you order though, I do recommend cutting out potential frame sizes from paper and hanging them in your space to determine the exact sizes you need. 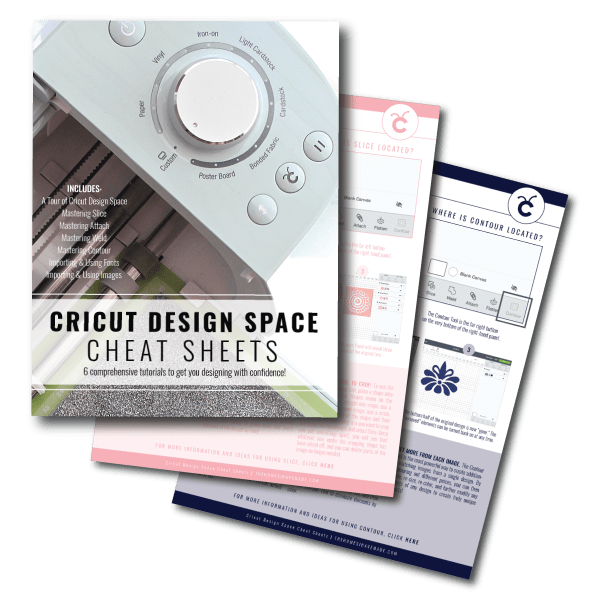 Oftentimes, you may think you need small when you need big or vice versa…and it can be so disappointing when your custom-printed art isn’t quite a custom fit in the end. 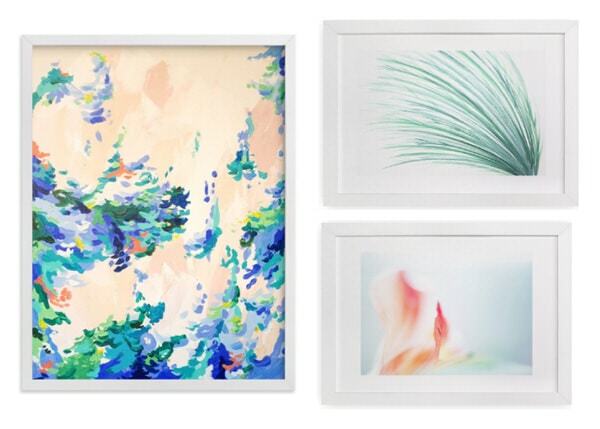 Take advantage of this awesome feature of Minted by measuring first, ordering second! 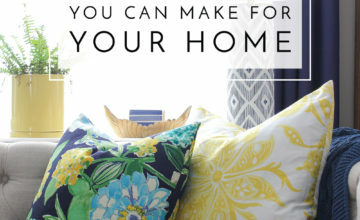 Even using all these tips, it still took me a little while to land on a collection of prints I loved for our entryway. It’s a tricky thing, so don’t feel discouraged if you don’t get it quite right the first few times you try (I even had to re-order one of my larger prints because my original selection just wasn’t working!) 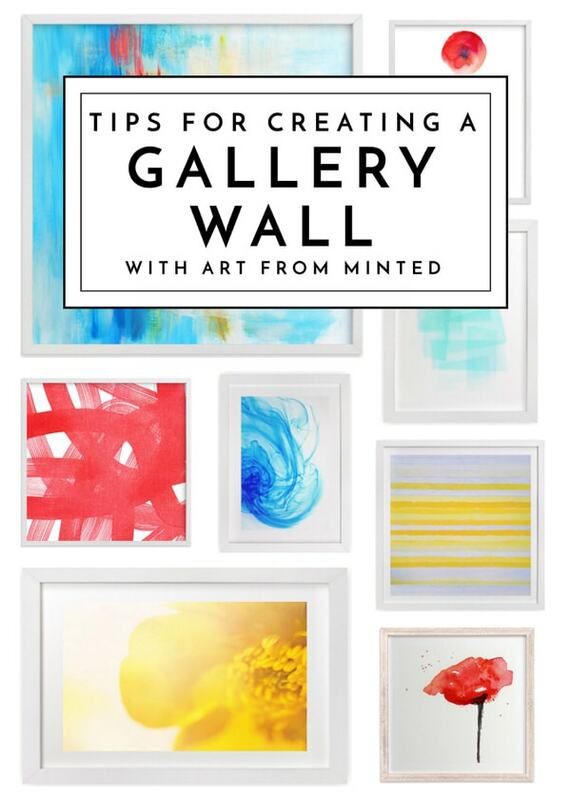 Hopefully though, these tips will empower you to feel more confident as you select artwork for your home because it really can have such a positive influence in a space. If you have an artwork tip you rely on, I’d love to hear it in the comments below. And be sure to meet me back here on Friday – I’m going to share a quick tip for getting your selected artwork “custom framed” on the cheap! See you then!